NaruOne Korean Restaurant is located at the basement level in the bustling Pitt St (aka Korean Town) and can be easily missed. Once you are down there, you will be greeted with staff in orange uniform and a nice clean dining area. The large platter of fried chicken seemed to be their specialty, literally every table ordered a plate. The bubbling Kimchi Seafood Hot Pot also looked very appetising. We know what we wanted: the most-talked about Korean Fried Chicken. 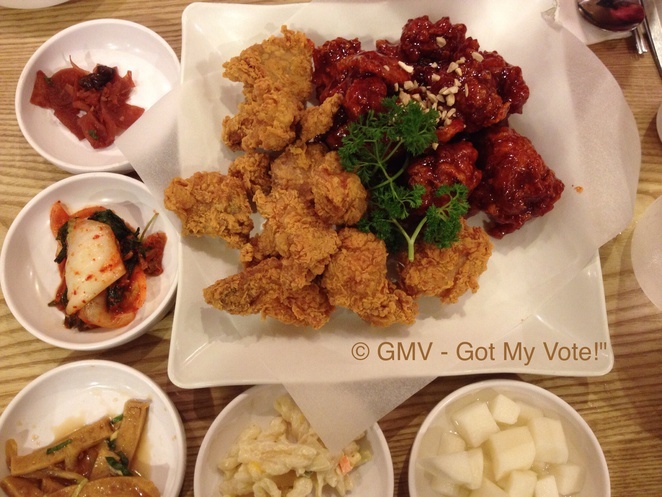 We ordered NaruOne's Famous Naruone Fried Chicken in Half & Half (Boneless Fried Chicken Gangjung & Boneless Fried Chicken Gangjung with Sweet & Spicy Sauce for $33.00). It was one huge plate of fried chicken and it pretty much occupied the entire table. They were freshly out of the deep-fryer with golden crunchy coating. They almost looked identical like KFC's hot & spicy chicken. Of course they didn't disappoint. We were exceedingly pleased with the loud crunchy bite sound and tender soft chicken inside. These were so much better than KFC! The sweet and spicy flavour (the reddish sauce) has a bit of chilli kick to them. They were slightly sticky like sweet and sour sauce but were crunchier & more moreish. 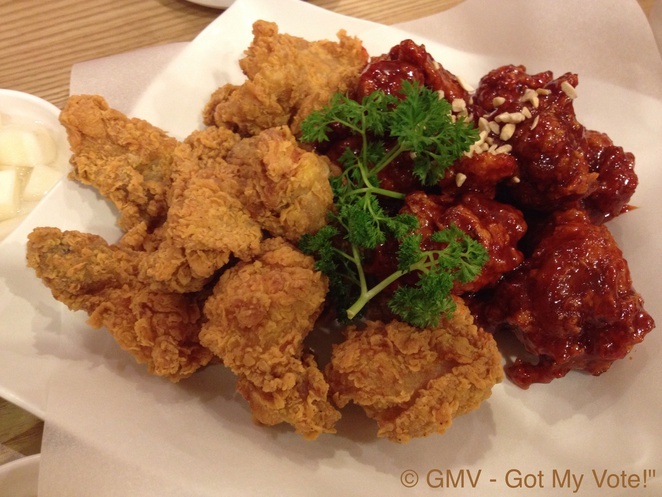 I preferred the Original fried chicken and my friend liked the Sweet & Spicy flavour. The complementary bowl of radish cubes soaked in vinegar provided a refreshing taste in between bites. 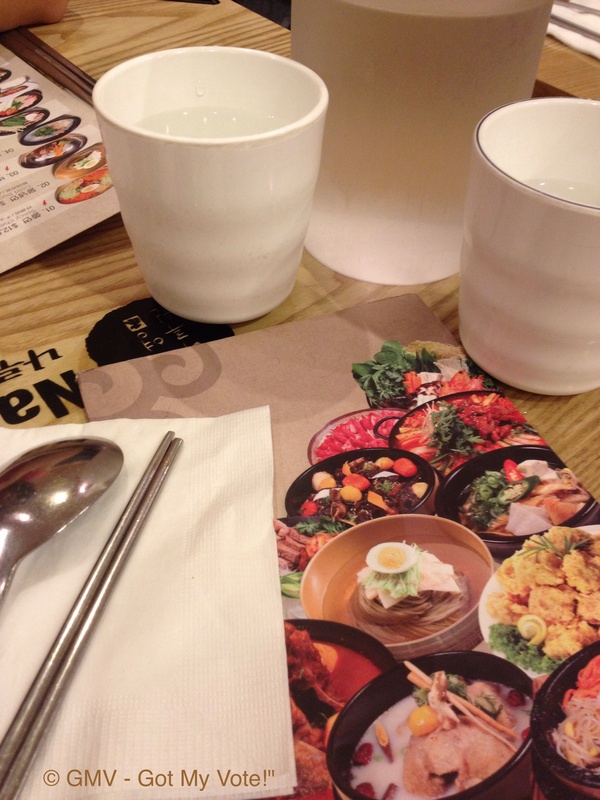 The menu is full of eye-catching pictures of Korean cuisines. the main text and descriptions are all in the Korean language, but there are English subtitles as well. We are here solely for their signature extra-crunchy Korean Fried Chicken, we don't really need a translation. Half way through the meal, we thought we might try other Korean signature dishes as well. My friend and I deliberated and pondered over the menu to narrow down what to get. 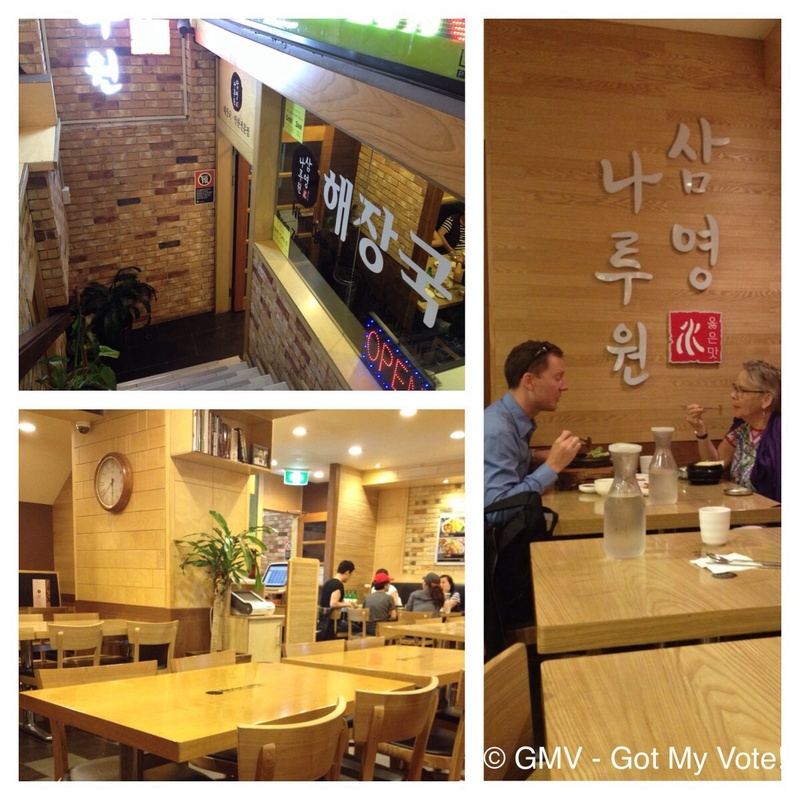 The diners were mainly native Koreans so we had a quick peep around to see what else they ordered. We ordered the Spicy Chewy Cold Noodles ($12.00), which was a lighter and healthier selection to balance out the fried chicken feast. We were presented with a large stainless steel bowl with a lot of veggies in it. Now that was a drastic change from all the deep-fried naughtiness to a wholesome rabbit wonderland? We were confused when the waitstaff placed a pair of scissors on the table. We looked around, poked around a bit. Ah-ha! The noodles were all hidden underneath. We poured in the accompany mild chilli sauce and gave it an overhaul good mix! This is a 'Stirer's dish'! When combined with the mixed veggies, the noodles was very refreshing. It was quiet a nice dish. The pair of scissors was for us to cut the long slippery noodles into bite sizes length. Clever huh? We were also served with 4 complementary side dishes. 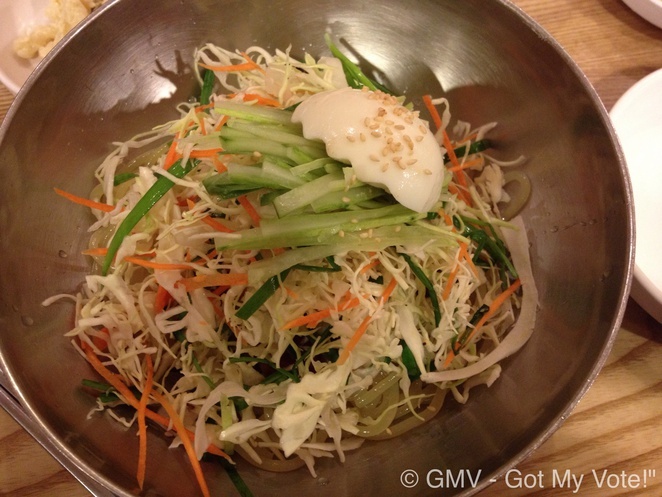 I absolutely adore these Korean small side dishes (banchan), they were very colourful, flavorsome and addictive. Banchan are essential part of the Korean dining culture and all authentic Korean restaurant will offer up to 6 small side dishes (sometimes more!) with any main purchased. They are all free of charge and with complementary refills. My Korean friend provided some good advice on 'How to tell if you are dining at an authentic Korean restaurant?' If the restaurant would charge you for each banchan, get up and leave immediately. We found the restaurant is quite spacious and you can eat in comfort without elbowing your neighbour or getting in the way of the waitress. The internal set-up is warm and inviting with wood-based furnishings. 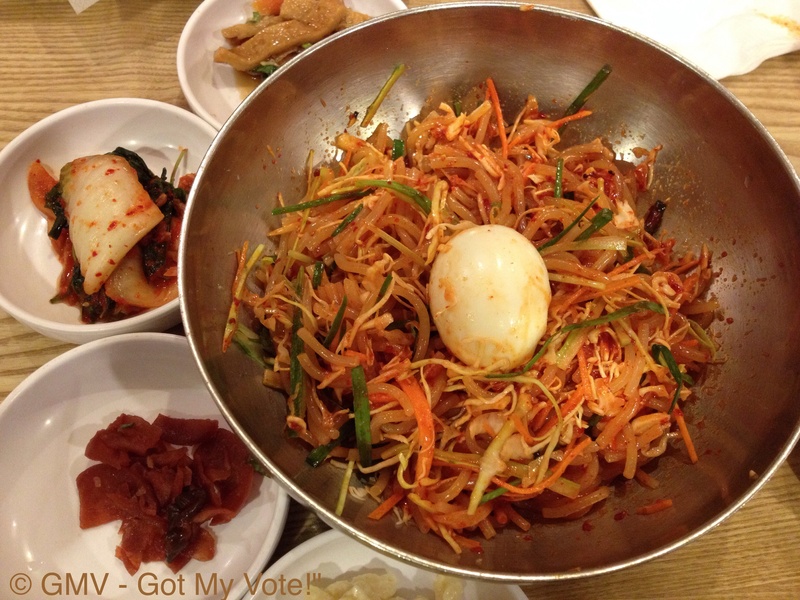 Food trend forecast already indicated that Korean cuisine will become the next popular thing. I just shared one of my favourite Korean restaurants and their crispy but not greasy Fried Chicken. What's your favourite Korean restaurants? I love the fried chicken from NaruOne! Best place in Sydney!